"Don't just count your Years, Make your Years Count" this quote by Ernest Meyers is very inspiring. 42 years today, my Mother gave birth to a healthy baby. She said that I was different from her first born because I was big. I think I gave her the worst labor pain any mother could experience but she said the pain was worth it. Thank you Ma for giving me a life that is worth living. I thank God for you and Papa and for this life I am enjoying. Thanks to My SparlPeople Family for Remembering my Day! As I grow older, my priorities have changed, my perspective have changed, and my focus in life have changed. I am satisfied of being a stay-at-home-Mom. Some people perceived it as "unproductive" in terms of career but I see it as my lifetime investment and treasure because I get to take care of my children everyday and I never miss any of their milestones. That to me is greater than earning big chunk of money. Different people thinks differently and I am who I am, I chose this kind of lifestyle and I don't care what other think or say. I get irritated when someone tells me, "Oh you must have all the time in the world coz you don't work". Most of the times I just keep my cool because deep inside I want to tell them "Oh I have a full time job and another part time job!" It doesn't really help to explain because they seem to not understand the true meaning of why we chose to stay with our children but any stay at home mom would agree that it is a full time job. It's a tough job but you get the reward that money can't buy! Okay, enough talk, it's the hormone that's talking lol. It's my birthday and I have a lot of things to do with my kids. Before I end this post, let me greet the following June celebrants: Happy birthday to you all and may God bless you on your special day! My youngest sister Mae who will celebrate her birthday tomorrow. My sister-in-law, Crystal, is also celebrating her brithday on the 15th. A friend of mine, Rossel, is also celebrating her birthday today. And lastly, my sister Rosel will also celebrate her birthday on the 20th. Oh check these celebrities (celebrating their birthdays this month as well). I also learned that JUNE is a national Rose Month! How awesome! Thaks for taking tome to read! You know what, you have to do what makes YOU happy. You can't live your life to make others happy - you have to make YOU happy! Happy Birthday to all of you! Being a mom is THE best and most important job! It is way more than full-time! I love this! There's a difference between existing and living! SAHMs are the most productive people on earth and I don't know why some see them as unproductive. You are older and definitely wiser. Happy Birthday!!! Happy Birthday to you and everyone else! It's so great to hear someone talk about how happy they are with what they've chosen to do in life. Too often people just grumble and complain, it's encouraging to hear the opposite! Being a mom is one of the hardest jobs in the world. If other people think moms are unproductive because they don't have jobs, that is their problem. I have been in the work environment. Plus a stay home home. I can say being a stay home mom is one of the hardest jobs I have ever done. Your not only a stay at home mom. You have many other duties to perform with no help or someone to ask for how to do. Like you would at a 9 to 5 job. Some parents have no support system at all. I totally agree with you. When my children as stil little, I always cry and miss my family back home because I felt so alone here. It would have been easier if I was around with my family. I love my in-laws but they also have their own busy lives. Happy Birthday! Being a mom is a 24 hour a day job and I admire all moms. I was a SAHM when my kids were little and I wouldn't trade those memories for anything in this world. Happy birthday! That quite really hits home as I also approach my 42nd birthday in about 5 weeks (eep!) I am totally guilty of counting the years and I need to stop. It's unproductive. I am also happy as a SAHM after years and years of being in a corporate job. I feel much more appreciated now. Ayeh! Advance happy birthday to you too! I love that quote! Happy Birthday to you and all your loved ones in this month of June! Wow, it's amazing how close all those birthdays are to each other! A big happy birthday to them all, hope you have tons of fun celebrating them. It's so cool that you know all these people with June birthdays. Happy Birthday to you and all your friends and family! Wow! Happy Birthday to you and your family and friends who also have June birthdays. My husband has his birthday on the 29th so we will be celebrating then. Happy Birthday! I hope that you had a great one. I too am a stay at home mom/work at home mom and find it quite rewarding. That is such a great quote and I really need to live by it. I need to quit living to work and start working to live, thanks for the great reminder!! Happy Birthday to you all! I too believe in making the most of every day and leaving a legacy. It truly is important to make each day count, PERIOD. Thank you for sharing this special and thoughtful part of yourself. Happy Birthday! Being a hands-on mom is a full-time job. The sacrifices and work are great, you don't have a day off and you don't get paid, but like you said, it's the most fulfilling job on earth. Happy birthday, Rose! When you've got a few kids, being a stay at home mom is a full time job. The only reason people say those things to you is because they forget the times when that's usually what women did. Happy birthday to everyone! I have the hardest time with my family because they don't think blogging or staying home are jobs. They think I wasted my schooling (university). Awwww...you are absolutely right I stop counting my age at 21 hehehehe..i guess we just want to make sure we remember how old we are in case we've ask or fill out something..may you have a great one and hope all your dreams come true.. belated happy birthday. So sweet and thoughtful reminder. As my late dad always remind us "Aged with years". Birthday Happy Sis Rose. Being a stay at home mom is definitely a full-time job but it has also been one of the most rewarding things I have ever done. 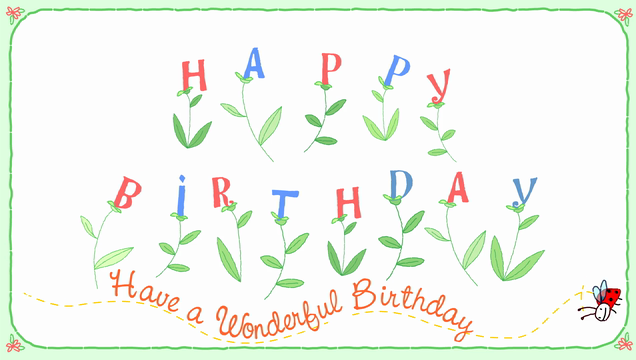 Hope that you had a wonderful birthday! I love this! I think it's very important to make the most of everything. I love this post. I have seen where someone came up with a salary for a stay at home mom if it was a paid occupation. It was around 100k depending on where you live. I enjoy being home with my kids but it's a ton of work. I love the quote "Don't just count the years but, make the years count." This is something we all should live by indeed. Happy Birthday to everyone!! Thanks for sharing. Love this so much! Its important to celebrate moments in life remember the good times put smiles on peoples faces and live everyday to the fullest great post and happy b day to all! I hate when people tell me that I need to have higher goals or whatever because I am a SAHM- honestly I am content with who I am and where I am. Of course I would like "more" but that doesn't mean I would change who I am. Yes, so true. I love the quote at the beginning of this post. It's so important to really live...to appreciate what is important. I really enjoyed reading this. Sometimes we need the reminder to live our lives to the fullest. I love that quote! It's so true and something we all need to live by. Happy birthday! Thats so great you were able to find inner peace within yourself, I am still working on that currently and it seems as thought it is a road I will soon travel.